I like places that think they’re at the centre of the world – I am from London, after all. Sicilians, custodians of a beautiful, historically fascinating island slap bang in the middle of the Mediterranean Sea, are entitled to hold this conviction about where they live. 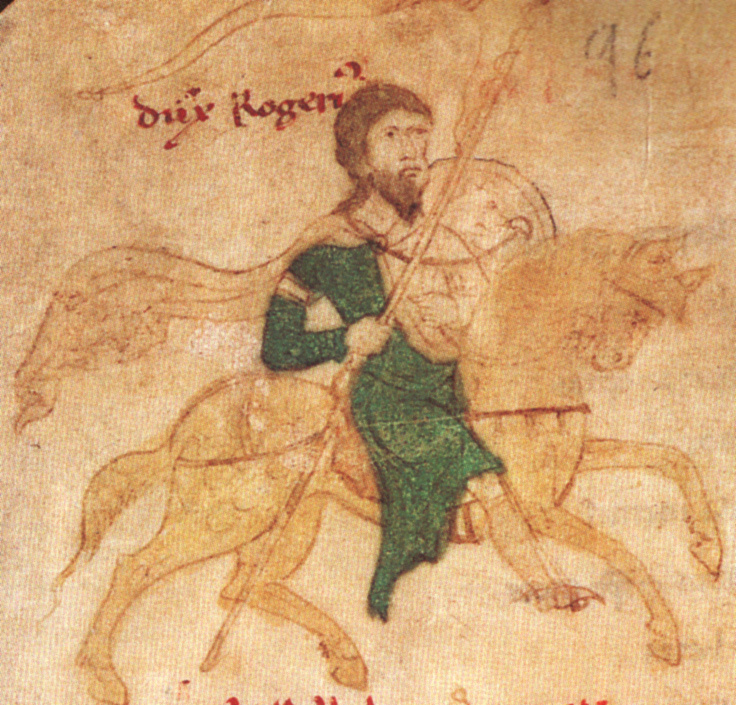 Roger II: unlikely name, great King of Sicily, had at least 15 kids. Proof it's a great place for nippers! The main reason for saying this is because you can’t. Sicily may not look big on a map, but it’ll take longer than you think to travel places. 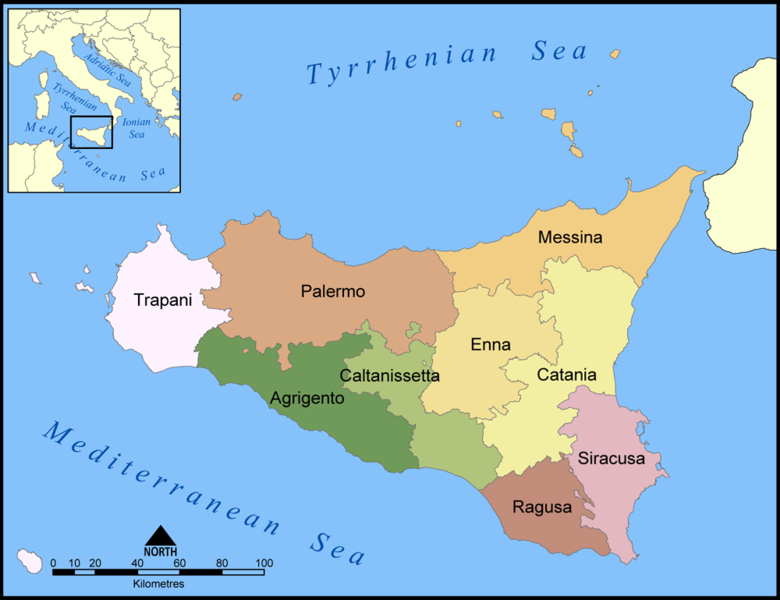 Distances are reasonably big, Trapani to Palermo for example is 43 miles (69km) while Catania to the capital is 100 miles (160km). Larger cities are linked by smooth dual-carriageway roads, but head inland and you’ll find yourself on spectacular but slower roads through the mountains. Sicily has an amazing amount of things to do, too, and there’s enough for a month of child-friendly half-day trips. Once the island is seen there are islands too, including volcanic Stromboli and Vulcano. We chose an area – the north-west of the island and saw it in some detail, visiting Palermo, Monreale, the hilltop treasure of Erice (best reached by a fun cable car) and the ancient sites of Selinunte and Segesta in a week, exploring from our base in Castellammare del Golfo. We are fixed on returning soon and basing ourselves on the Ionian Coast to see the highlights of this area, as well as returning to Palermo. If you try to pack in too much you’ll exhaust yourselves and get frustrated, so slow down and make the most of your immediate surroundings. Sicily has trains and buses but a car is perfect for touring with kids. You quickly get the hang of driving (including mastering being on the ‘wrong’ side of the road if you’re British) but also adapt to Sicilian motoring style, which means going fast, driving right up the jacksy of the car you wish to overtake and, in Palermo, ignoring whatever lane restrictions or rights of way are in place. I found it quickly became a lot of fun, even in the capital. Trains were slow, and buses left you reliant on someone else’s timetable, plus with a car you could go precisely where you wanted, when. There are beautiful drives everywhere. Big city + hot sunshine + a fearsome reputation for traffic = a succession of tantrums from children and parents. Right? Maybe. But Palermo doesn’t have to be like that. If you’re a gallery fan, church crawler or a mosaic obsessive you might feel the odd pang of frustration that you’re in a city offering serious cultural overload much of which will be out of reach, but then you’ve probably come on holiday prepared to compromise. This might mean that you bag the wonderful Arab-Norman cathedral from the outside. No biggie. Its interior won’t get your blood pumping if you’re been to Monreale or even the Chiesa della Martorana, the wonderful chapel that’s home to some of Palermo’s best mosaic work. It might also mean heading for the Palatine Chapel first thing in the morning or not at all. But there’s more to Palermo than this. Our eldest grizzled at being in a trafficky, smelly city so we took a stroll through some random back-alleys, discovering a quieter side to the city and getting glimpses of baroque palaces hiding behind enormous, ancient doorways. There’s enough at nearby Monreale to visit this lovely hilltop town separately, by the way. And in many ways it is more kid friendly, as you can ascend dome of the Cathedral, run riot in the Cloisters and lunch in the lovely piazza, complete with fountains. Self catering is a good idea with small children anyway, but unless yours like staying up late it can be pretty much the only way to feed them in many places between 4 and 7pm, when restaurants stop serving and many cafes shut too. Though things start waking up in the early evening, this is Passeggiata time, when Sicilians hit the streets for a promenade, gossip and an espresso or something stronger. We tended to feed our lads the usual time they had dinner and then head out and join the fun. Sicily has some wonderful ancient sites, and it’s not hard to make them fun for those too young to appreciate the subtleties of Doric capitals and the superb settings of many of the islands Greek sites. 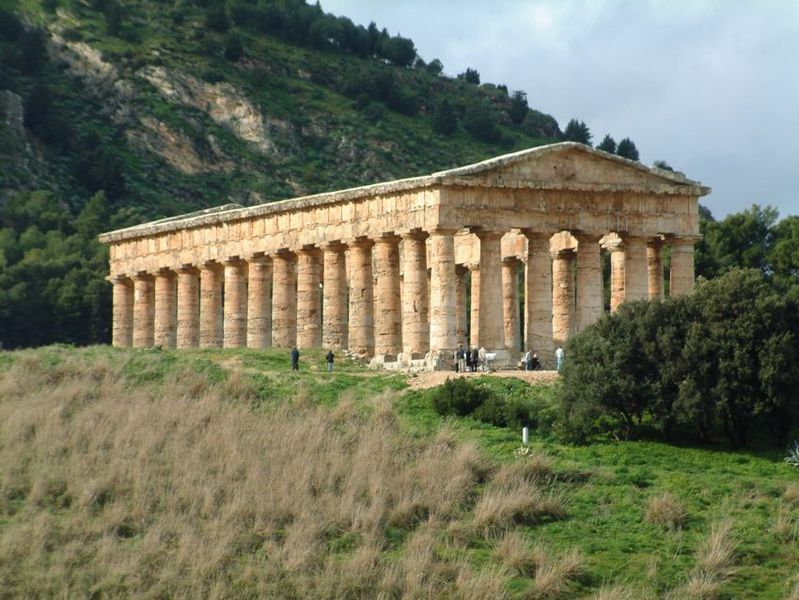 Climbing, hide and seek and even an impromptu concert in the amphitheatre at Segesta made our visits to these places some of the best of the trip. You’re never far from a great beach, and if you’re from a northern climate you might be able to enjoy them when the Italians shy away from a dip. In early May we had a vast stretch of beach at Castellammare, obviously mobbed in July and August, all to ourselves. The sea was around 20c and eminently paddleable. Keep buckets and spades in your hire car. This was easy. Pasta and pizza were always on hand, and could be followed up with delicious fresh fruit, gelato and sweet pastries for after, either as pick-me-ups or bribes after another Arab-Norman church. In Maria Grammatica’s famous patisserie in Erice we got pretty much all of these on the table at once, and took half of them away with us for later. 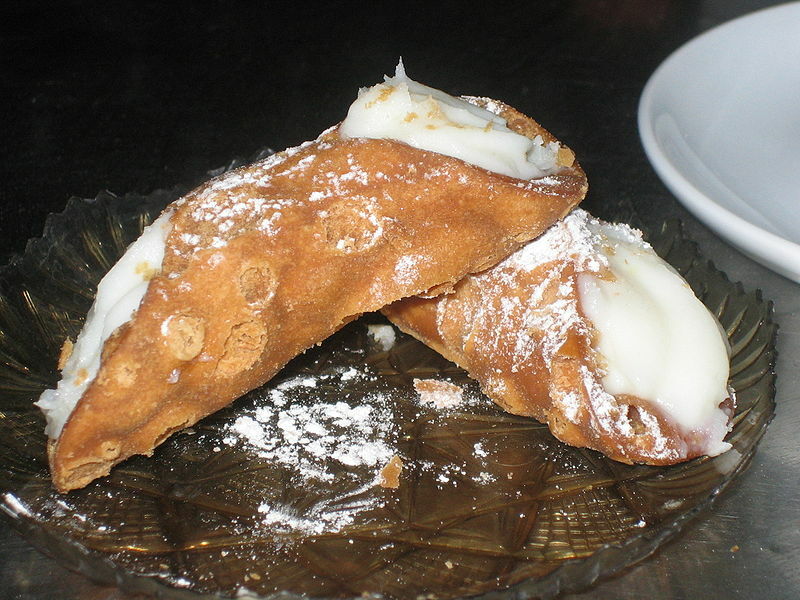 At weekends you can get huge cannoli – crunchy pastries with a creamy filling – as an afternoon treat. Most of all, don’t fret too much. Sicilians love kids and will love yours, so bring them along when you go to buy fresh-baked bread, cheese, olives and tomatoes first thing in the morning or kick a ball around the piazza at Passeggiata time. There’s nothing you’ll need that you can’t find easily, apart from a good stack of English-language DVD’s, books and magazines for the flight home you can pull out when some fresh stimulation is needed. This entry was posted in Uncategorized and tagged Castellammare del Golfo, Erice, Italy, Italy family travel, Italy with children, Italy with kids, Monreale, Palermo family travel, Palermo with kids, Sicily, Sicily beaches, Sicily family travel, Sicily with children, Sicily with kids. Bookmark the permalink.